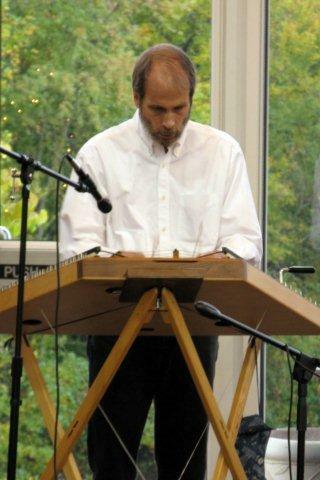 With an eclectic repertoire of music arranged for hammered dulcimer, I am available to play for concerts, weddings, receptions, and parties. Fees vary dependent upon length of performance, driving distance, and whether learning new material is requested for the particular event. My solo repertoire includes traditional fiddle tunes, airs, and waltzes from North America and the British Isles; instrumental arrangements of pop songs, baroque and other "classical" pieces, original compositions, and winter holiday music. To inquire about availability for events in the central Virginia area, please phone 804.320.8474 or e-mail bob@robertwadsworth.com. I also play in a four-piece (fiddle, hammered dulcimer, guitar, string bass) contradance string band, Engine 615. To inquire about the band's availability, please e-mail fiddle player Tom Groseclose at TSGASHLAND@aol.com.